Since purchasing his rural home in July 2012, owner Nolan Pray faces several structural foundation cracks that warrant closer inspection and analysis. As a mechanical engineer working for an internationally renowned manufacturer of construction machinery and power systems, Nolan’s expertise in the design of commercial equipment underpins his methodical analysis and engineering approach to problem solving. Upon consulting a licensed structural engineer about his repair options, Nolan deployed Buildera CRACKMON® 2D crack monitors to track and pinpoint the underlying conditions affecting his settling foundation. CRACKMON® crack monitors are cost-effective crack-measurement gauges with better than ±0.5-millimeter horizontal and vertical discrimination. Nolan’s property, situated just outside of Peoria, Illinois, exhibits classic geotechnical conditions for drainage problems and differential settlement. Built in the woods on clayey soil, variable ground conditions and surface runoff stress Nolan's foundation. Between expansive soil and tree-root absorption, the strata beneath Nolan’s home are particularly susceptible to seasonal changes in ground-moisture content. Built on a hillside plot with a negative-sloping driveway, the home's original construction intended to effectively divert rainfall. As Nolan describes, “Our entire front yard and driveway slope towards the house until about three meters in front of the house, where it slopes back up in an attempt to keep the water from the foundation.” Despite conscientious design to mitigate drainage issues, the downpour of recent winter storms breached the barrier. A record-breaking rainy season dumped up to 20 centimeters of rain in a given day, causing water to pool near Nolan’s house where the driveway and front yard have settled. 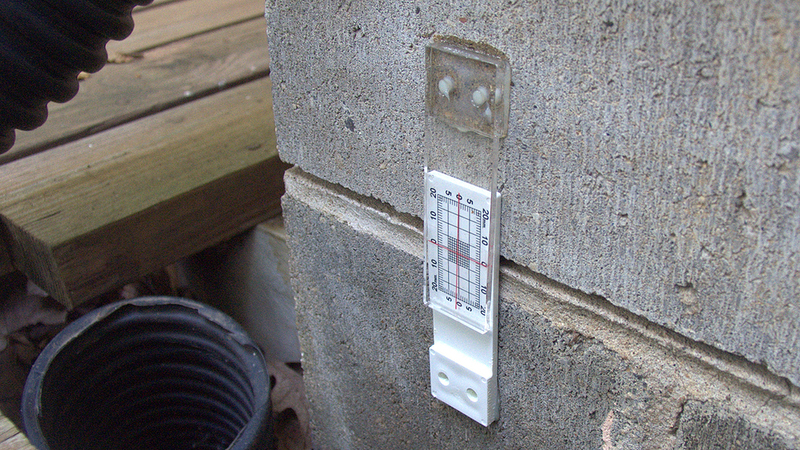 This settlement allows moisture to seep alongside the structure, flooding the crawl-space. 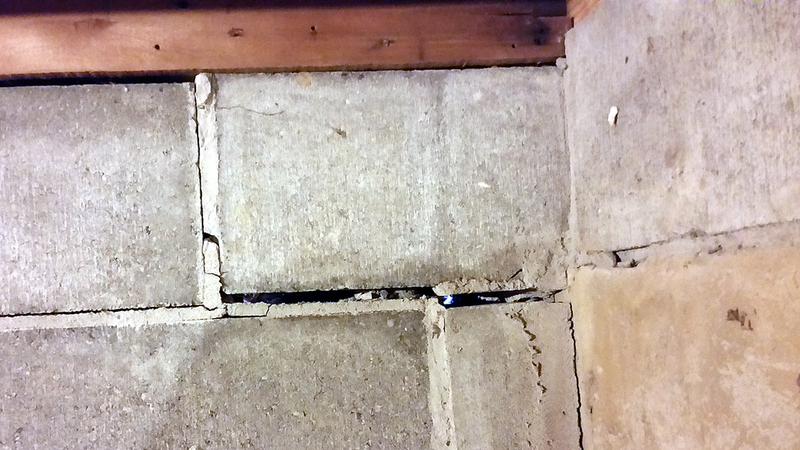 Extremely moist conditions induce cracks in concrete-block mortar joints along Nolan’s crawl-space walls. As Figure 1 illustrates, daylight shines through the most severe cracks, measuring up to 10 millimeters wide. In addition to moisture impact to Nolan’s foundation, a series of tiered retaining walls surrounding the house began to lean outward. The retaining walls—extending from the back of the house supporting a concrete patio—were built over 30 years ago from recycled railroad ties. Nolan is currently replacing the rotting retaining walls, but suspects that the weakening walls have compounded cracking of his foundation. The leaning retaining walls reduce lateral support to the house, evidenced by separation cracks in the concrete blocks atop the foundation pad. 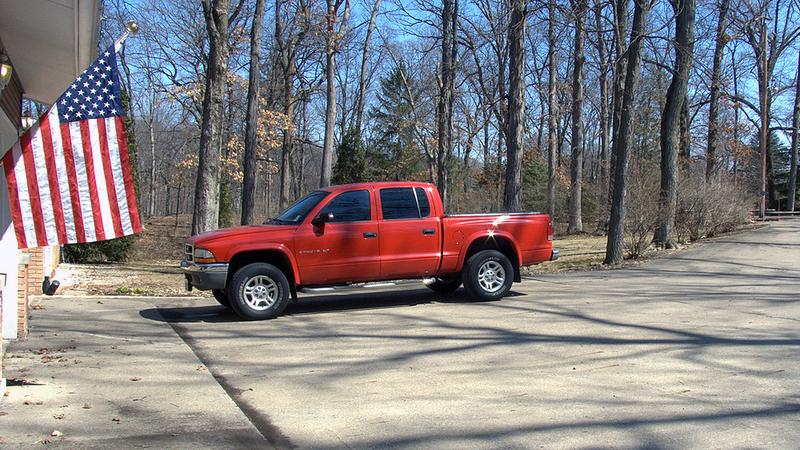 Cracking is particularly apparent on a portion of the foundation wall that supports a two-car garage, where adequate support is essential to sustain heavy loads. cracks along the posterior wall of the crawl space. Since multiple factors interplay in Nolan’s case, it is essential to measure the crack growth rate as well as pinpoint the likely causes of specific structural shifts. Through long-term continuous monitoring and meticulous note keeping, Nolan can accurately track when significant shifts occur and correlate measurements to the environmental conditions causing discrete movement. Installing one crack monitor using L-brackets, Nolan can detect whether outward movement is occurring between foundation blocks that support his garage due to his leaning retaining walls. Since crack monitors reside in just a few select areas, a CRACKMON® 224R crack-width comparator measures the width of other minor cracks to paint a comprehensive picture of overall structural shifting . Supplementary measurements using the CRACKMON® 224R let Nolan precisely measure crack widths that may exceed critical dimensions outlined in American Concrete Institute ACI 224R-01 . While carrying out large-scale home renovations, Nolan gains critical structural insight using Buildera CRACKMON® 2D crack monitors. The Buildera CRACKMON® 2D crack monitors foster an integral understanding of Nolan’s foundation issues and enable him to concurrently observe and document multiple points of concern over an extended time period. This is especially important given the multiple geotechnical and environmental factors impacting structural integrity. Armed with sound scientific data, Nolan and his structural engineer can devise an appropriate remedy to prevent future moisture incursions into the crawl space and basement and thus stabilize the foundation. Nolan Pray holds a BS degree in Mechanical Engineering from the South Dakota School of Mines and Technology and has been a mechanical engineer with Caterpillar®, Inc. since 2010. In his spare time, he enjoys repairing his home, hunting, SCUBA diving and working on vehicles. The views and opinions expressed herein are solely Nolan's and do not constitute a product endorsement from any employer or third party. "Buildera CRACKMON® Crack Monitor." Installation Guide and Engineering Specifications CM-IG-90200-00002EN Ver 1.5. Buildera, 21 July 2014. Printed. "Buildera CRACKMON® 224R: ACI 224R-01 Compliant Pocket Crack-Width Comparator." Data Sheet and User Instructions CM-DS-90200-00224EN Ver 1.0. Buildera, 1 August 2014. Printed. Application story by Michele Meltzer. Photos ©2014 Nolan Pray, reproduced with permission. Please contact Buildera for written authorization to reproduce electronically or in print. ©2014 Buildera. All rights reserved.